The Z6/Z7 looks pretty neat but the battery life doesn't sound great for u/w use. I don't know how this compares with, say, the Sony mirrorless cameras. But having to charge/change batteries every 300 or so images isn't something I'd be too keen on. For sure, the Z7/6 are nice and the future, but one card slot and battery life (for me) is a deal breaker -- I don't want to have to change batteries every 1-2 dives or worry about limiting my shooting to save battery power. Pass. For me the main issue with the Z6 and Z7 for underwater use is that I don’t think that they AF with AF-D type lenses. This means lenses like the Nikon 16mm, Sigma 15mm fisheyes, the Tokina 10-17mm fisheye and the Nikon 28-70mm that we use with the Nauticam WACP, and any converted Nikonos RS lenses. In short a big loss for many underwater photographers. The only common lenses that work are the 8-15mm and 16-35mm. I have both of these, but for many people the need to have to but one (especially the 8-15mm) is a big financial penalty for switching to the Z-series. That said, I have not tried the Z series cameras yet. So I am not 100% certain on this. And Nikon’s promotional material isn’t exactly forthcoming on the matter - talking about what is compatible, rather than what isn’t. Perhaps this Z discussion should be split into a new thread. I am looking at them, too. I will use it for underwater and landscape/nature use. For UW, I see that the flash sync is 1/200, which seems surprisingly low. I was hoping for even faster than 1/250. I also see that Low ISO on the Z7 is 32, which is nice! The size of the 24-70 lens is just right, and a compact 14-30 fixed F4 zoom is coming next year. there are some photos of it at nikonrumors. The image quality from sample shots on the web so far looks just outstanding from the new lenses. There are conflicting reports about the battery life, with some people using the camera claiming up to 1000 shots plus some video clips. So the jury is still out on that one. Also, the adapter has a square protruding base with a tripod mount. Don't know how that would work with round housing and port openings. But, would allow the 8-15, 16-35, 60mm and 105mm macros. I am not going to be using any converted RS lenses so that does not bother me. Alex, why would the WACP not work with a 24-70 zoom? I know the WACP is optimized for lenses that begin at 28mm, but couldn't you just limit your zooming from 28 to 70? Right now, I shoot M43 underwater, and Nikon DSLRs for my above water. I was hoping that I could get into a "single system" Nikon FF but compact system for hiking, with all the mirrorless advantages (including much better video and video AF, which the Z cameras certainly do deliver) and not needing the huge and bulky DSLR housings (the Sony A9 housings are pretty much as big as I want to go). But, I am not sure if these will do the job. I have a pre-order in, but have several weeks to cancel if more information comes out that would show these will not work underwater. I was sure that was going to upgrade to the Z7 before the announcement: the size difference for a D8xx camera is substantial so will be the housing, but after seeing the first impressions and specs I'm a bit turned down by the flash sync speed (why 1/200???) and apparently the focus performance (no more 3d mode! why?). The best I've heard the people that tried the camera saying about the autofocus was that it was Sony good (arghh :-) but nevertheless without eye detect! Another thing that bothers me is that they remove the AF/MF selector and focus mode/focus zones button. Probably you can get around this with programmable buttons, but I fear that with the touchscreen capabilities that latest cameras are having, underwater photographers will start to loose some control in their housings. The single XQD card doesn't bother me but this was a huge mistake from Nikon, keeping lot's of potential buyers from buying these cameras. I do think that DSLR's are a dying technology (I personally have some difficulties in spending so much money in technology that appears to be reaching the end of it's life cycle) but probably the D850 is still the best camera for UW photography. The mirrorless cameras have the huge size advantage (less weight, less drag while diving against current) and the ability to use the back lcd to take photos while holding the housing at arms length (DSLR's can do it but with unusable autofocus). I will wait to see more detailed reviews especially concerning autofocus performance (with and without the adapter) to choose - give me top performance to the 105 and 8-15 lenses and I'm good to go! (if it's good with these two surely it will with the 60mm and the 16-35 which I use way more sparsely). Edited by miguelpereira, 24 August 2018 - 08:29 AM. This system needs time to mature before I would be willing to jump in. I have concerns about the actual use of existing lenses with the adapter for underwater use, and although I appreciate the desire to keep the same battery, it looks like too great a compromise. I will be interested to see what Canon does, but it looks like I won't be abandoning the Olympus just yet. Still, it looks like interesting times ahead for mirrorless. 3d focus mode is there, but accessed through a custom button setup. So far, the AF does not seem to be as "instant" as with the DSLR's. Like Sony, it is fast but not that "ultimate" speed. Still, for me, there is no way I am going to a DSLR setup due to size, so what I am looking for is the "best" of the mirrorless options. I have friend who shoots the Oly EMI mk ii on blackwater dives and gets great results, so mirrorless AF has reached the level of "good enough" if not the absolute best. The 1/200 is not great, but for sunball shots you have ISO 32 so you can still drop the exposure 2 stops more than the ISO 200 minimum camera I have now. So, that might not be so big of a deal. In other words, the cameras have flaws, but ones I could probably live with in exchange for the benefits. My main concern is whether the adapter, with its extended square base due to the tripod mount, will fit in housings. Hopefully Nauticam or Reef Photo will give us some insight as to that. So far, it looks like the adapter will work excellently with all current model G lenses, which is what I have. I've several reviews saying that it does not have 3d focus. The Nikon website specs mention all focus zones and 3d focus isn't one of them. Lowering ISO requires more strobe power, raising shutter speed does not so you are always loosing something with a lower flash sync speed. According to a press release from Atomos. it would be possible to record a 10 bit 4K HDR from the new Nikon 7 series mirrorless cameras. I think that until the lens compatibility issues are confirmed, these are a non-starter for underwater use. None of the lenses that have been announced thus far are really useful for underwater use. It remains to be seen how well the adapter works with F mount lenses, but until this performance is confirmed, I would not be rushing out to buy one! I'm not sure what the housing manufacturers will do with them. Given the above, I would guess that they are also going to wait and see. Tooling up for new housings is an expensive business and if there are effectively no suitable lenses, may yet be a wasted expense. Seems the battery estimate is quite low, with reports of 1500+ shots and some video too. It seems that housings would need to be able to fit the FTZ to really be a viable option for using this camera underwater. Edited by JamesR, 26 August 2018 - 05:12 PM. If we are looking at them from a purely video perspective, I think m43 is still a better bet as you will be running the lenses at f8 (if not greater) to get an reasonable DoF. The stated dynamic range in video they say is 12stops (similar to m43) and no 60p. so the only benefit would be C-AF, and lower noise potentially - both of which Sony have got sorted on their A7 series. The FTZ does NOT support screw-drive type AF. It might be possible for someone to develop one that does, either Nikon or a 3rd party. However, it might turn out that the communications protocols in the new Z cameras will not allow this, e.g., adapted lens AF is too slow (such as changing focusing direction). But..... there is another alternative that seems more interesting to me. That would be to develop an RSTZ adapter for manual-focusing-only with Nikonos RS lenses like done on the RS camera bodies. This would require an adapter with a the screw drive in it but instead of communicating with the Z camera body, it would communicate with an RS analog control switch on the housing (e.g., with a cable)!!! If I recall correctly the RS manual focusing switch controlled focusing speed as well as direction. Therefore a functional analog (to the RS) would be preferred. This hypothetical RSTZ adapter would obviously have to be paired with a housing that came with this switch. Edited by Tom_Kline, 27 August 2018 - 11:49 AM. Housing manufacturers will surely make housings for these cameras (we are talking about the system that is going to replace dslr's in a not so far future). I believe that Sea&Sea are already taking pre-orders of their housings for the Z cameras. As for the space for the adapter that should be real easy as the distance between the mount and the grip should be enough for that, without any special modification to the housing therefore. Edited by miguelpereira, 31 August 2018 - 06:58 PM. 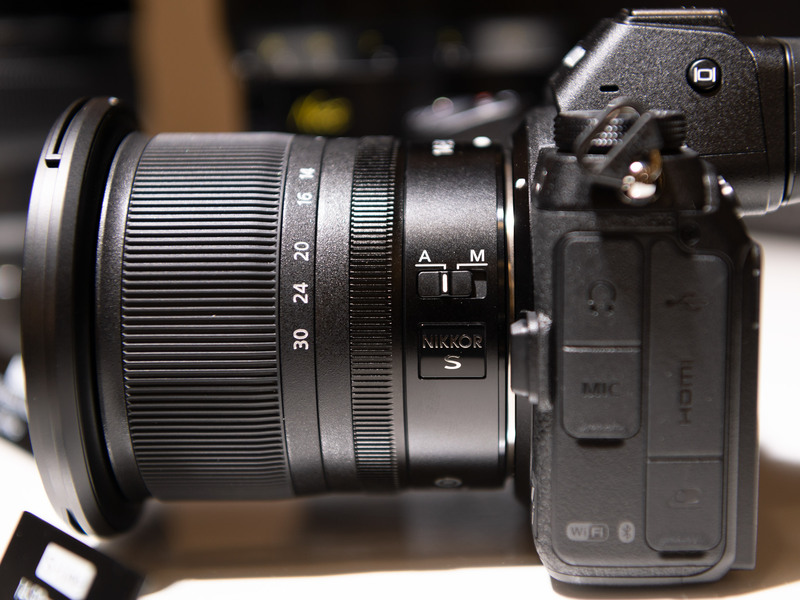 The 14-30mm seems very interesting, but the photos of the mockup do not show if it has internal focussing, or extending front elements like the 24-70Z. Would considerable extension imply a shift of the entry pupil that would pose problems behind a dome? Edited by geo, 03 September 2018 - 12:13 PM. Edited by Tom_Kline, 03 September 2018 - 01:40 PM.